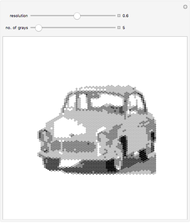 This Demonstration rasterizes an image in a hexagonal grid. The "resolution" slider controls the raster size and the "no. of grays" controls the number of gray levels (in other words, posterization).